DICE has officially announced and revealed the gameplay trailer of their upcoming Next Generation Battlefield 4 FPS which would be released in Fall 2013. The next generation Battlefield 4 is based on the latest Frosbite 3 technology that delivers new levels of realism and destruction effects which provide an amazing visual and shooter experience. The game is available for PC,PS3, Xbox 360 at a retail price of $59.99 for standard and $69.99 for Digital Deluxe Edition. REDWOOD CITY, Calif.–(BUSINESS WIRE)– Only in Battlefield™ can players go through a building instead of around it or eject from a jet and take out the enemy mid-free fall. Those incredible gameplay moments that blur the line between game and glory can only be created by players, and occur only in Battlefield. 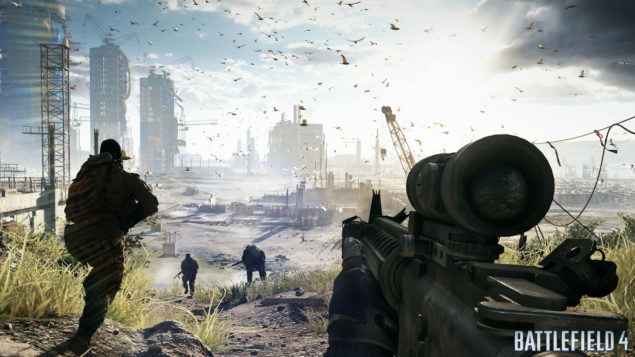 DICE, a studio of Electronic Arts Inc. (NASDAQ:EA), today announced Battlefield 4™, a genre-defining action blockbuster launching in Fall 2013. Powered by the advanced technology of DICE’s proprietary Frostbite™ 3 engine, Battlefield 4 offers players a glimpse into the future of interactive entertainment — a future that is more human, dramatic and believable than anything before it. With more than 65 million players worldwide, the Battlefield series has consistently been praised by critics for its world-class multiplayer gameplay, and is recognized as the only game that allows players to own land, sea and air. The game made its world debut today with a staggering 17-minute gameplay demo, available for view at Battlefield.com. The demo begins as the player — Recker — opens his eyes to discover that he is trapped in a rapidly sinking car with three of his squad mates. Shooting the window is the only way out. Panic and fear are pushed aside as Recker makes a difficult decision — take the shot and recover the intel but risk that not everyone will survive. The emotional demo features a cast of characters unrivaled in interactive entertainment. Players will learn how to work together in both the Campaign and Multiplayer, issuing squad orders and comparing achievements in both experiences. Adventure and Competition will unfold through a series of beautifully crafted locations constructed with some of the best art and sound design in modern shooters. All of this is only possible with Frostbite 3 — a new standard for interactive entertainment in 2013. To view the first Battlefield 4 single player gameplay footage, please visit www.battlefield.com. To join the conversation on Battlefield 4, please visit http://www.facebook.com/battlefield, follow us on Twitter® at www.twitter.com/battlefield and #BF4, or sign up for the official Battlefield newsletter at www.battlefield.com. Press assets for Battlefield 4 are available athttp://info.ea.com.